Founded in 2008, Shock Wave Engineering provides Internet of Things (IoT) solutions in the agriculture and mining industries. The company provides systems for both standard and customised development projects and is a sought-after solutions provider for its ability to addresses unique problems in specialised areas. 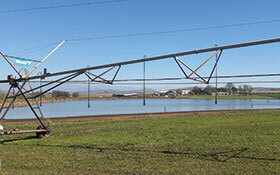 In agriculture, Shock Wave Engineering focuses on reducing the water usage per unit of crops produced, as well as improving the energy efficiency and maintenance needs of the pumps used for centre pivot irrigation systems. The company had previously developed its own cloud platform to achieve this goal, but experienced serious scalability and flexibility limitations. There are several variables influencing a pivot system’s efficiency (e.g. worn pumps, incorrect pump sizes, small or blocked pipelines, and excessive pivot pressure among others). Therefore, running pivot systems sub-optimally results in high energy consumption, unnecessary water usage and increased maintenance costs. The result is a reduction in farm profitability. A broken pump or pipe, at a critical time in the growing phase, can lead to crop failure. Similarly, over or under-watering could have the same result. To overcome the scalability and flexibility issues, as well as assist clients to optimise their water and energy usage, Shock Wave Engineering uses the PTC ThingWorx platform, supplied by 1Worx in sub-Saharan Africa. The ability to have real-time visibility into a system’s performance, to identify system bottlenecks and improve operational efficiencies, is a core feature of the Shock Wave system. It also provides actionable insight through the use of real-time alerting, making it possible to respond quickly to problems, and to manage by exception, saving time, effort and money. Since implementing the ThingWorx-based Smart Connect Pivot Irrigation System, Shock Wave Engineering has been able to improve client water and energy consumption with a typical energy savings of around 40%, and a guaranteed energy savings of 15%. One of its clients saves the equivalent of a dam full of water every two years. This smart digital solution reduces the energy, water and maintenance requirements of irrigation systems in the agriculture industry, thereby reducing the cost per unit of produce. The ThingWorx Industrial Innovation Platform is a complete, end-to-end technology solution that enables industrial businesses to unlock the value of the IoT. It delivers the tools and technologies needed for rapid development and deployment of powerful applications and augmented reality (AR) experiences. The platform includes compatible modules that deliver the functionality, flexibility and agility enterprises need to implement IoT apps and AR experiences. This includes industrial connectivity, analytics, application enablement, orchestration and AR authoring. • Purpose-built platform: the platform contains specific functionality designed with the scalability and security to grow as a business expands. • Rapid development, deployment, and extensibility: platform modules come together via the ThingModel – a true digital representation of a physical object – enabling apps and experiences to be delivered quickly and easily. • Ultimate flexibility: the platform can be deployed in the cloud, on premise, or a hybrid of the two. Apps and experiences are made available to users in multiple formats – desktop, web and mobile and AR. Integration with external data sources simplifies processes and ensures more meaningful results. • Vibrant ecosystem: ThingWorx partner ecosystem offers one of the world’s largest networks of IoT-focused companies, and ThingWorx partners offer a wide range of products and services that simplify, accelerate, or enhance processes and strategies for industrial IoT. 1Worx is the sole ThingWorx supplier for sub-Saharan Africa with a client base that includes companies in the mining, agricultural and manufacturing industries. 1Worx has a highly competent team of subject matter experts that includes certified ThingWorx associate developers, as well as a certified ThingWorx trainer. 1Worx prides itself on creating awareness around Industry 4.0 in South Africa through programmes at academic institutions and ThingWorx training.